When national tennis player Shaheed Alam clinched the 2017 Southeast Asia Men’s Invitational Tournament Tennis singles gold after overcoming a 4-2 deficit in both sets, he knew he had his family and tennis coaches to thank, as well as his running shoes. ‘Because tennis is usually seen as a technical sports some people forget that on some levels, especially the professionals, there’s a lot of physical and aerobic endurance involved’ said Shaheed who is working towards the 2017 SEA Games in Kuala Lumpur, and is managed by ONEathlete. Rising above a rough year in 2016, Shaheed feels that running has elevated his game and given him greater confidence to focus and perform when the pressure is on, or when the match stretches for 2-3 hours. While most of us are more interested in playing sports like football or basketball as a social activity or part of a healthy lifestyle, running can feel like the distant relative we know but never wish to meet (even though we should). Running is taxing for many of us precisely because it uses a lot of large muscle groups, more than swimming or cycling. This also makes running one of the most efficient way to train your lungs and legs to work longer and harder, for that much-needed boost (you wished you had) when chasing down that scoring opportunity. Running is also great for building muscular endurance for sports like hockey or football which involves a lot of time on the legs and non-stop moving that alternates between a jog and all-out sprints for games lasting as long as 90mins. It is also a common misconception that running does not benefit upper-body sports like canoeing or kayaking. Studies published by UK Sports Physiologists and Psychologists in 2009 seem to suggest that our performance in sports could be limited by our perception of that limit rather than limits of physical or cardiovascular abilities. In other words, our brain usually gives up before our body. So if you are aiming to play your weekend games more competitively, or even become your team’s star player, then learning to handle mental discomfort is par for the course. And we all know what makes us very uncomfortable very quickly. For time-strapped weekend sports warriors, running can be scheduled on weekdays for as little as 20-30 minutes to stay fit while saving the weekends for team games when it’s easier to schedule a game together. Jonathan also shares his staple workout when he’s in a heavy training (paddling) season – hill running or car pushing for a quick yet (very) effective workout. Next time someone asks you about the secret in having the upper hand in any sports, tell them its actually the ‘upper legs’. 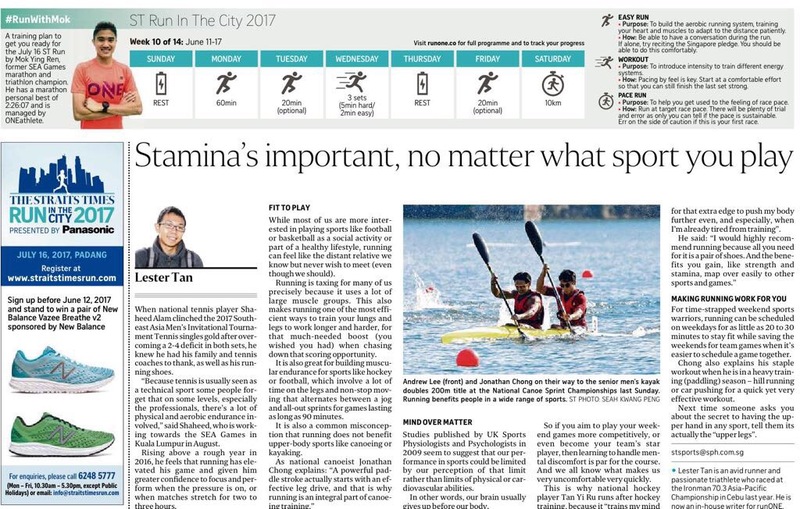 Or you can join runONE, the training partner for Straits Times Run, for the upcoming race clinic! Lester is an avid runner and passionate triathlete who raced at the Asia-Pacific 70.3 World Champs in Cebu. He thinks sports is the greatest metaphor for life and is now an in-house writer for runONE.